Euthanasia would be for people who are 'terminally ill' but how is it possible to decide the expectancy of life, I wonder, said Ashish Tiwari, physician and medico-legal expert. "Euthanasia can become a means of containing healthcare costs. However, it can be misused by healthcare providers. Euthanasia can become non-voluntary because emotional and psychological pressures on such patients will increase and they will be inclined to opt for passive euthanasia. Legalising euthanasia and assisted suicide is contagious. Is suicide a legitimate answer to life's problems?" Tiwari said that euthanasia is a rejection of the importance and value of human life. With euthanasia, no one's life is being saved instead life is only taken away, he added. "The right to live with dignity is more important than right to die with dignity." The Centre, had earlier raised objections to legalising the concept of ‘Living Will’. It pointed out that this may lead to the abuse and neglect of the elderly, especially if they were financially well-off, The Hindu reported. The government had pointed out that the living will was a concept which contradicts a person's instinctive urge to survive, the newspaper said. Hailing the Supreme Court's decision on passive euthanasia, Ashish Tiwari, physician and medico-legal expert said, it would be useful in rarest of rare cases. However, he said, "it must be decided by a team of domain experts and verified by central team. Otherwise in a country like our's, there are chances of it being misused much more than it being used," he said. The elderly couple from Mumbai, who sought legalistaion of active euthanasia, said they are not satisfied with the Supreme Court order. Narayan (88) and Iravati (78) do not suffer from any terminal ailment but are motivated by the will to die after having lived a satisfactory life. They also fear having to live without the other. The couple told ANI that the government should give the right to active euthanasia and assisted suicide to people above 75. Senior advocate Mahesh Jethmalani welcomed the Supreme Court decision on passive euthanasia stating that he believes any individual who is very ill and unable to take care of himself should be allowed to make a decision on his life. "Anyone who is reduced to a life that is unlike that of a sentient being should be given the choice of deciding on his/her life. Any liberty that is given is liable to be misused. Care must be taken to ensure this does not happen by putting strict guidelines," he said. In response to an unstarred question submitted to the Lok Sabha during the Winter Session of Parliament last year, Ashwini Kumar Choubey, MoS, health and family welfare, said that the government is yet to finalise the bill allowing passive euthanasia and that such formulation of legislation is under consideration in the health ministry. The reply also mentioned that the government is not against letting people make ‘living wills’ to stop medical treatment in future, if he/she becomes terminally ill. The right to live with dignity includes the right to die with dignity. The individual must at all times be in charge of their medical treatment. Indian law has always recognised this principle of medical autonomy. The problem arises when this medical autonomy conflicts with the prohibition against a person ending their own life, argues Ajay Kumar in this Firstpost article. A living will in some cases can permit an individual to effectively end their own life by refusing medical treatment that would keep them alive longer. Further, it is evident that the state has an interest in the life of a person. While the decision to passively euthanise oneself can be left to the patient, the conditions on when this right may be invoked can be left to a medical board. A living will makes sense if coupled with a medical power of attorney and independent third party monitoring. This will allow for a middle way between all the interests that are at play here. The Right of the patient, the State's interest in human life and the interest of the family of the patient. 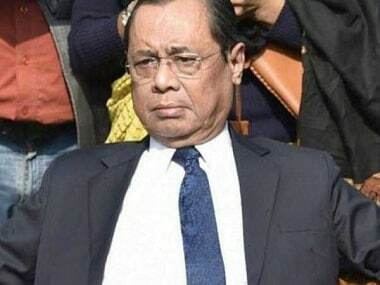 According to senior lawyer Prashant Bhushan, the apex court said any individual has full right to decide that he should not take any kind of medical treatment should not be kept alive on life support system. And if that person so decides, his decision is binding on the doctors and his family members have to respect and give effect to his decision. If a person leaves a living will that if he becomes unconscious and his life can only be prolong by artificial life support systems, then that living will should be effected by the doctors and his family. If a person fell unconscious and has not expressed his will and he can only be kept alive on life support system then the treating doctors and family members together can decide to withdraw life support system if they feel that the person is in an incurable state. Historically, India is no stranger to the right to die, argues this Firstpost article. Unlike the west, where giving up one’s life is a sin, a criminal act, in India, as in most Oriental cultures, opting to die is often an act of honour, of salvation. Cultural practices like santhara among the Jain community allows a person to conclude that his work in this world is done and over with, and that he must now prepare for the soul’s onward journey, namely death. Such a person stops consuming food and water, and allows his body to waste away. Even Hinduism permits this. Hindu saints are known to take sanyas and even opt for samadhi. This convention and belief involves a saint holding his very breath, and through meditation allows the body and the soul to get separated. In many ways, even the vanaprastha stage advocated by Hinduism allows for a person to leave the material world and wander into the forest, where he is no longer distracted by the world of attachments. How the person eventually dies, remains unknown. It is another practice that is both voluntary and immensely venerated. "Today the Supreme Court has delivered a historic decision. The constitution bench has cleared all the air on passive euthanasia," said Supreme Court advocate Prashant Bhushan. Chief Justice Dipak Misra, in his judgment, laid down specific guidelines to test the validity of a "living will", reported The Hindu. He also details who should certify the living will, when and how it comes into effect etc. The guidelines also mention what is to be done if there is no living will and how to make a plea for passive euthanasia, the report added. "Aruna Shanbaug could not have exercised Living Will, but it is a good decision by the Supreme Court," says Dr Avinash Supe, Dean, KEM Hospital. Supe said it was a much-needed decision. "The concept of Do Not Resuscitate (DNR) is an established concept in the West. Many patients ask doctors to not prolong their lives with interventions and medicines. Elderly who suffer can now discuss with family members and take a decision on Living Will. The ailing may be relieved of their pain while their family members can avoid the stress of seeing their loved ones suffer through medical interventions, ICU, etc and also medical expenses." "However, having said that, there must be strict guidelines which should be followed. In Aruna Shanbaug's case, the Supreme Court had recognised passive euthanasia by which it had permitted withdrawal of life-sustaining treatment from patients not in a position to make an informed decision. Today's decision goes further. It is welcome," Dr Supe said. Stating in the Supreme Court judgment, Justice AK Sikri justified his opinion and said that even though religion, law, philosophy, morality and society share conflicting opinions on the right to life and if it includes the right to death as well, they all concur that a person should be able to die with dignity, reported The Hindu. Sanjay Oak, former dean of KEM Hospital in Mumbai, has been a strong opponent of passive euthanasia. Today, he reiterated his stand and said he stands by his decision. Advocate Dinesh Tiwari, criminal lawyer, says that the decision on euthanasia was long overdue. "It is a very good judgment. It provides a huge relief for those who are in pain and find the pain unbearable to continue living. The Supreme Court ruling is a good development. However, there are chances of the ruling being misused. To avoid this, state governments can lay more procedures in keeping with the apex court ruling to avoid it being misused." Why is physician-assisted suicide complex? The issue of physician-assisted suicide is complex because sentiment about the practice ranges greatly from strong support for personal freedoms to religious backlash that insists it is murder and against the teachings of God. At this juncture, it seems that the debate will need to be settled before progress towards an agreeable solution will take place. Let us begin with Barnard's story about a patient named Eli Kahn. Aged 78, he was suffering from carcinoma of the prostate, obstruction of the bowel, and very severe emphysema. Mr. Kahn said to his doctor: "You mustn't try to save my life. I am ready to die. The machine is worn out, and the mechanic must now give up." "No," was the reply, "this is not a hospital which just allows patients to die like that. We treat you here, we don't just let you die." In its landmark judgment on 'living will' for passive euthanasia, the apex court upheld that the fundamental right to a meaningful existence included a person's choice to die without suffering, reported The Hindu. CJI Dipak Misra also detailed how pressure from society and fear of criminal liability led to prolonging a patient's suffering, resulting in his/her "undignified death". The court also added that it was time to let go of such shared suffering and face reality. 11 May, 2005: Supreme Court takes note of PIL of NGO 'Common Cause' seeking nod to allow terminally-ill persons to execute a living will for passive euthanasia. It seeks the Centre's response on the plea which seeks declaration of 'right to die with dignity' as a Fundamental Right under Article 21 (right to life) of the Constitution. 16 January, 2006: Supreme Court allows Delhi Medical Council (DMC) to intervene and asks it to file documents on passive euthanasia. 28 April, 2006: Law Commission suggests a draft bill on passive euthanasia and says such pleas be made to high courts which should decide after taking experts' views. 31 January, 2007: Supreme Court asks parties to file documents. 7 March, 2011: Supreme Court, on a separate plea on behalf of Aruna Shanbaug, allows passive euthanasia for the nurse lying in vegetative state at a hospital in Mumbai. 23 January, 2014: A three-judge bench led by then-CJI P Sathasivam starts final hearing in the case. 11 February: DMC files copy of proceedings of International Workshop for Policy Statement on Euthanasia in India and SC reserves verdict. 25 February: Supreme Court cites inconsistencies in earlier verdicts on passive euthanasia including the one given in the Shanbaug case and refers the PIL to a Constitution bench. 15 July: A five-judge bench commences hearing on the plea, issues notices to all states and UTs, and appoints senior advocate TR Andhyarujina as an amicus curiae. He dies during the pendency of the case. 15 February, 2016: Centre says that it is deliberating the issue. 11 October, 2017: Five-judge Constitution bench led by CJI Dipak Misra hears arguments and reserves the verdict. 9 March, 2018: Supreme Court recognises 'living will' made by terminally-ill patients for passive euthanasia and lays down guidelines on procedures to be adopted for it. The Supreme Court judgment on passive euthanasia is a big relief to family members of terminally-ill patients, emotionally, financially and legally. To decide to pull the plug on a family member who is on artificial life support system with rising medical costs and very little or no hope of survival is in itself a tortuous decision to make. But that is nothing compared to the insensitivity the family goes through with the legal system. Passive euthanasia won't begin from today, now that the Supreme Court has legalised it. It is the worst kept secret of our medicare system. This is how passive euthanasia used to work on the ground: The hospital or treating doctors would advise family members about the futility of keeping the patient on life support any longer. They would not take any responsibility beyond that because passive euthanasia was illegal. It would now be up to the family to decide whether and when to switch off. What should be a joint decision would be pinned solely on the family. But it wouldn't stop there because most hospitals don't like to show the death on their statistics, they would then force the family to shift the patient home. Worse, to legally secure the hospital, the release certificate would term it "discharge against medical advise" after actually advising the family, unofficially, to the contrary. Legally, the hospital would want no responsibility. Following the discharge, if the patient died on the way home — a real possibility in the circumstances — then the family would run into problems procuring the death certificate because the hospital would now be out of the picture and there would be nobody to certify the death. The family would then have to run around for a doctor who would be willing to certify the death. That is why the SC judgement is so welcome. Now, all this can happen legally and in a hospital. The judgement does not recognise just the right to dignity of death, but it relieves the family of enormous emotional and legal hassles by legalising what was anyway happening in every hospital. Speaking to Firstpost, Father Sebastian Michael, secretary, inter-religious commission, Archdiocese of Mumbai said that as a citizen of India he respects the Supreme Court decision. "However, as a Christian, I believe life is precious and cannot be taken away by anyone. Eeven by oneself. We have no right to take anyone's life or even our's. We have to live out life. I understand that sometimes certain circumstances in life may be very difficult. However, these teach lessons for the individuals and society. No one should take away another's life or his/her own." The court also laid down guidelines governing execution and enforcement of living wills, as well as procedure to be followed for passive Euthanasia in case there is no living will/advance directive. Full text of the judgment is still awaited. 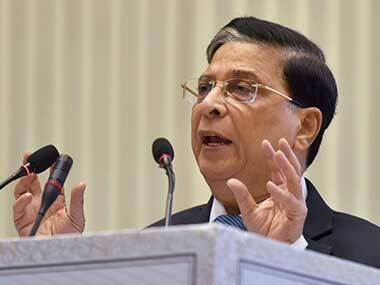 CJI Dipak Misra, while reading out the judgment, said that though there were four separate opinions of the bench but all the judges were unanimous that the 'living will' should be permitted since a person cannot be allowed to continue suffering in a comatose state when he or she doesn't wish to live. What did the Supreme Court observe? - Terminally ill patients can make living will. Why was there a verdict on passive euthanasia after Aruna Shanbaug case? Friday's Supreme Court verdict is not primarily on passive euthanasia or its legality. 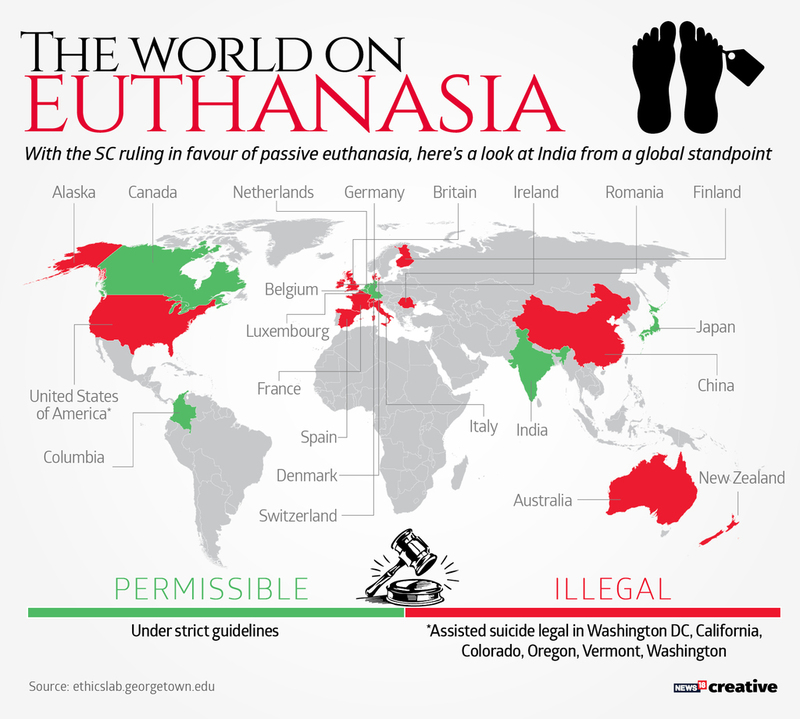 Last year, on 11 October, the Centre had categorically informed the Supreme Court that "passive euthanasia" was the law of the land and that the government was in conformity with it. The top court in its verdict on 7 March, 2014 in Aruna Shanbaug case had permitted passive euthanasia or passive mercy killing under certain circumstances, provided it was backed by the permission of the high court concerned. Living will is a written document that allows a patient to give explicit instructions in advance about the medical treatment to be administered when he or she is terminally-ill or no longer able to express informed consent. While the Supreme Court has legalised passive euthanasia, it has not passed any judgment on active euthanasia. Passive euthanasia entails a withdrawal of medical treatment to deliberately hasten the death of a terminally-ill patient. While active euthanasia entails the use of lethal substances to end a life. Passive euthanasia has been made legal as doctors are not condemned for failing to save a life. They are not directly killing someone to save them from a worse death but are just denying saving them. While majority of the country is hailing the Supreme Court ruling on passive euthanasia as landmark, activist Rahul Eeswar tweeted and said that the judgment was sad and painful. "Sad and pained by Hon'ble Supreme Court Verdict ; The very idea of "living will" can be misused and more importantly not taking into account future growth of Science and medicine." Passive euthanasia is a person's right, Supreme Court has ruled. The top court also held that a living will by an individual demanding euthanasia, if in case the said individual is terminally ill, will also be recognised. Writer and one of the biggest supporters of passive euthanasia Pinki Virani said that Aruna Shanbaug gave the gift of passive euthanasia to the country and brought patients' rights into focus, even though the system failed her. Virani filed a euthanasia petition before the Supreme Court in 2009. 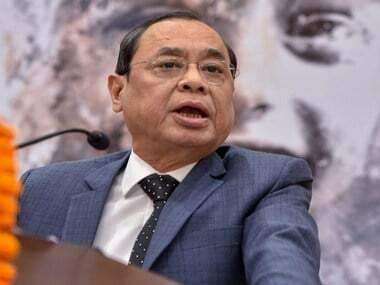 The judgment was delivered by a five-judge Constitution Bench of Chief Justice Dipak Misra and Justices AK Sikri, AM Khanwilkar, DY Chandrachud and Ashok Bhushan. The apex court also laid down guidelines governing execution and enforcement of living wills, as well as the procedure to be followed for passive Euthanasia in case there is no living will/advance directive. Supreme Court of India has held that right to die with dignity is a fundamental right. The five-judge Bench also held that passive euthanasia and a living will also legally valid. The Court has issued detailed guidelines in this regard. The death of 66-year-old nurse Aruna Shanbaug in 2015, who was sexually assaulted and left in a vegetative state for more than 40 years, had sparked a national debate over the legalisation of euthanasia. Senior lawyer Prashant Bhushan, who was the amicus curiae, in the case had stated that after Aruna Shanbaug case it was only the legal guardian or a medical board who could decide whether life support could be withdrawn to a terminally ill patient, but the person suffering from such terminal illness cannot decide, according to News18. Bhushan pleaded for active euthanasia to be allowed by saying that a person facing the only option of leading a life with suffering and pain, should have the sole right decide whether he should put an end to life with dignity. Sad and pained by Hon'ble Supreme Court Verdict ; The very idea of "living will" can be misused and more importantly not taking into account future growth of Science and medicine. Passive Euthanasia legalised latest updates: The Centre, had earlier raised objections to legalising the concept of ‘Living Will’. It pointed out that this may lead to the abuse and neglect of the elderly, especially if they were financially well-off. Meanwhile, medico legal experts also pointed out that such a provision could but psychological, societal pressure on such patients to cut medical expenses. Senior lawyers and medical practitioners across the country on Friday hailed the Supreme Court's judgment on passive euthanasia. Lawyer Prashant Bhushan said that the constitution bench has cleared all the air on passive euthanasia. Doctors also recalled the death of 66-year-old nurse Aruna Shanbaug, who had sparked a national debate over the legalisation of euthanasia. Elaborating the court's stand on passive euthanasia, Justice AK Sikri, in his separate opinion, said that even though religion, law, philosophy, morality and society share conflicting opinions on the right to life and if it includes the right to death as well, they all concur that a person should be able to die with dignity, reported The Hindu. In its judgment on "living will" authorising passive euthanasia, the apex court detailed that the fundamental right to a meaningful existence included a person's choice to die without suffering. CJI Dipak Misra also detailed how pressure from society and fear of criminal liability led to prolonging a patient's suffering, resulting in his/her "undignified death". 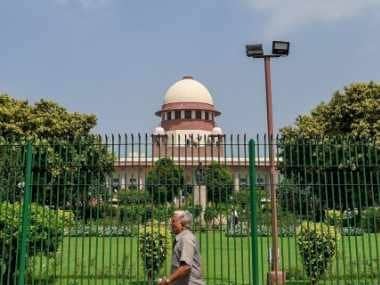 The Supreme Court on Friday said that a person can make an advance "living will" authorising the withdrawal of all life support system if in the opinion of doctor he has reached an irreversible stage of terminal illness. While allowing a person to make a living will, a five judge Constitution Bench headed by Chief Justice Dipak Misra, however, attached strict conditions for executing "a living will that was made by a person in his normal state of health and mind". The landmark judgment by the five-member Constitution bench also laid down guidelines governing execution and enforcement of living wills, as well as the procedure to be followed for passive Euthanasia in case there is no living will/advance directive. The bench, comprising Chief Justice of India Dipak Kumar Misra, Justice AK Sikri, Justice AM Khanwilkar, Justice DY Chandrachud and Justice Ashok Bhushan, passed the verdict on the plea to allow "living will" that will authorise the withdrawal of all life support systems if in the opinion of the doctors he has reached an irreversible stage of terminal illness. The Supreme Court said it has laid down guidelines on who would execute the will and how nod for passive euthanasia would be granted by the medical board. The top court further added that its guidelines and directives shall remain in force till a legislation is brought to deal with the issue. CJI Misra said other members of the five-judge Constitution bench have concurred on the guidelines and directives passed by it. Breaking: Supreme Court allows Passive Euthanasia; Also gives sanction to living will; issues guidelines governing execution of living will and also passive euthanasia in the absence of living wills. While reserving the order on 11 October, 2017, the Constitution Bench had observed that the right to die in peace could not be separated from Right to Life under Article 21 of the Constitution. This fuelled speculation that the court allow the right to make "living will", which allows a person to opt for passive euthanasia in the event of irreversible serious illness, by putting in place strict conditions including a medical board certifying that a person is in an irreversible state of terminal illness. An NGO Common Cause had moved the top court way back in 2005 seeking right to make a living will authorising withdrawal of life support system in the event of will makers reaching irreversible vegetative state. The central government had in the course of hearing of the matter by a five-judge Constitution Bench told the top court that passive euthanasia was the law of the land with safeguards by virtue of an earlier 2014 judgement of the top court in Aruna Shanbaug case. The top court by its order on 7 March, 2014, in Aruna Shanbaug case had permitted passive euthanasia under certain circumstances, provided it was backed by the permission of the high court. The Centre had also told the Constitution Bench that a draft bill permitting passive euthanasia with necessary safeguards was already before it for consideration.